A high level of stupidity has got me where I am today. It has only just occurred to me, as I vacuum clean and brush the WW2 greatcoat, inspecting it for live moth infestation (thankfully none), that it isn’t the best choice for the textile artist with a wool allergy is it? So… swollen eyes, itchy skin, and closing throat mean I have taken double dose of anti-histamine, and used a therapeutic amount of words with explosive consonants in. Mostly Fs and Bs. I look like I’ve been through some dark and terrible torture. There has been sneezing in industrial quantities. The cleaning process has now been completed, so the loose fibres and dust that caused the problem have now been removed. As long as I stitch it carefully, raising no ruckus (sp?) I should be ok from now on. The greatcoat looks great though now. I vacuumed it inside and out. 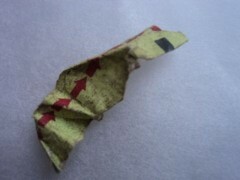 I found a small scrap of paper that looks like a tear strip with arrows on from a juicy fruit chewing gum wrapper. Along with sparkly dust that I have presumed to be the remains of the foil. The inside of the sleeves are dirty and greasy, black stuff delineating the creases. The buttonholes have been repaired with black coarse on the spot stitching. 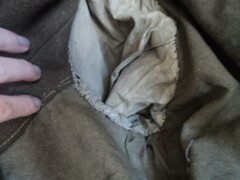 The coat is already small, but the wearer has used the same sort of stitching to take it in at the back, under the belt. Did he lose weight during the battles fought? The pockets are also greasy and dirty, but the tough fabric is mostly intact and will enable me to stitch the initials of the sponsors who will make this project fly. I love the fact that Belinda wanted me to stitch her Granddad’s initials rather than her own. Others have followed her lead, with the initials of members of their families who are ex- or serving soldiers… This lends my work a poignancy I had never imagined. I am humbled by their contribution to the life I lead in the free world, in a country where I am free to express myself. 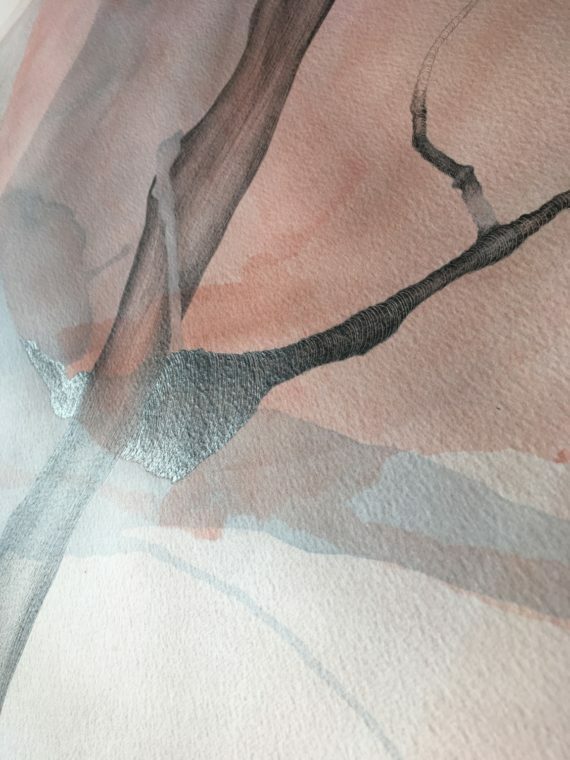 The group have raised an initial sum of money, and hope to apply for more funding to enable more artists from the group to travel to Jamestown with the work. 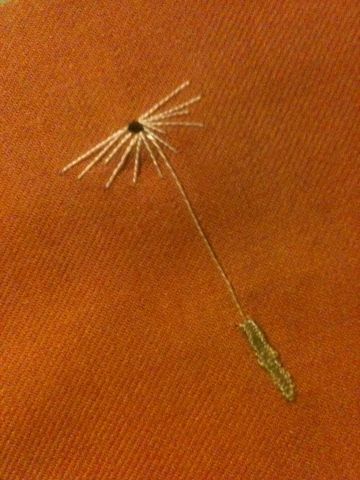 I will be stitching 200 of the dandelion seeds, as in the photo, onto a genuine World War 2 British Army greatcoat, as my contribution to the exhibition. I would really like it if each of these stitches were sponsored for £3 each in order to fund or part fund my flight to (and from, haha!) the US. Each sponsor will have their initials stitched into the pocket of the coat, and so will become part of the work! I now only use materials I already have, or old clothing/textiles sourced and donated and pinched. I have loads. Thread too. A whole cupboard and a half of threads. People have given me their grandma’s button tins, sewing boxes etc. I have a huge historical stash that is like treasure to me. I sit on top of it like a dragon on gold. So… I find myself on Boxing Day, ferreting through this hoard, becoming increasingly frustrated. 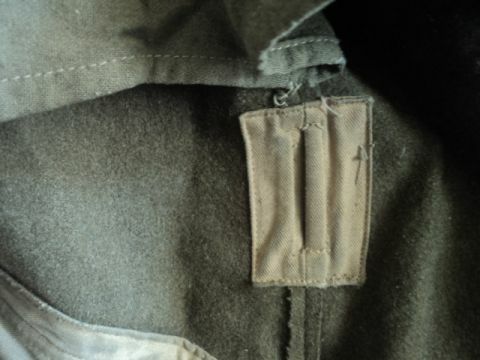 I want to start stitching the greatcoat this week. I have a picture in my head of how it should look, but can’t find anything in my stash that is quite right. So I have this pile of “nearly” threads, I will try them out, but they are either not quite the right colour, not quite the right thickness, or not quite the right texture. Do I compromise my principles and go out and buy new? Or do I compromise the finished article and use what I have? I haven’t done much since finishing that pair of pants. I don’t intend to now until after Christmas. I know I said in a previous post I was going to start on the greatcoat, but I had forgotten one crucial factor… Everyday Life. I moan about decorations being up too early and Christmas music in shops, and enforced jolliness… Why does Christmas have to be brightly lit, gaudy and jolly? Can’t Christmas be peaceful, thoughtful, reflective? Some people hate Christmas, and have good reasons to. This senseless commercial overkill must be physically painful, heartbreaking, sickening. I actually love Christmas… I love decorations, and trees inside the house and food and drink and family and friends, but I like it to start just the week before (about now) and I like to take it all away on January 2nd. And I like to remember people who aren’t with me to celebrate any more. I like to get sentimental and cry a little too. Christmas isn’t just one tone. I have dusted as an artist, vacuumed as an artist, made pastry for mince pies, made The Legendary Elena Thomas Lemon Shortbread, cranberry sauce and printed labels for parcels, all as an artist… which means I am doing it all consciously instead of resentfully, enjoying the feel of it all, and that feeling of satisfaction, the haptic reward of physical jobs, completed. 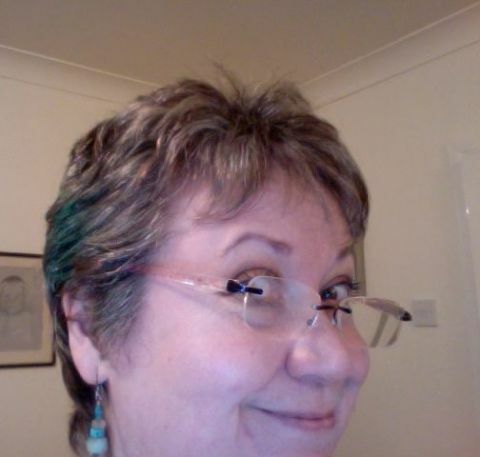 I had my hair cut as an artist and in a fit of festive whimsy, allowed the hairdresser to colour a small amount of it green. It is making me laugh. People either think it is stupid (which makes me laugh) or they think it is cool (which makes me laugh) or they think I think it’s cool (which makes me laugh). It’ll wash out in a week or so. But I did buy a bottle… so it might appear again for my birthday or somesuch occasion! I am resisting the urge to brighten up my husbands eyebrows while he sleeps (which makes me laugh). Have a happy Christmas if you can dear readers… and if you can’t, my thoughts are with you.